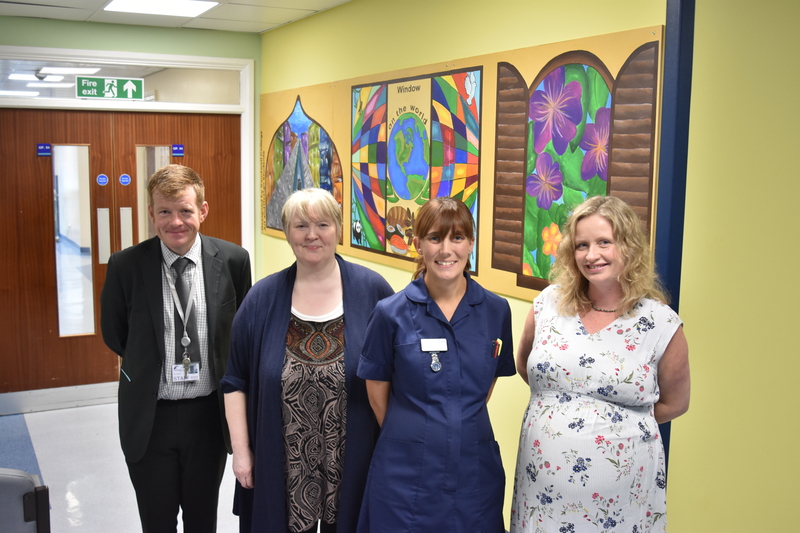 Black Country art students have transformed the waiting room at Sandwell Hospital’s fracture clinic by creating a colourful mural on the wall. The “enchanting” handiwork, named Window on the World” has been painted by students from Sandwell College and can be found hanging at the West Bromwich site. The budding artists took on the challenge as part of their community arts module. It was co-ordinated by healthcare charity Kissing it Better. (L-r) John McKeon, Head of Section for Construction at Sandwell College, Jackie Roxborough, from Kissing it Better, Lisa Comfort, Ward Sister, Helen Sweeting, Art and Design Lecturer at Sandwell College. 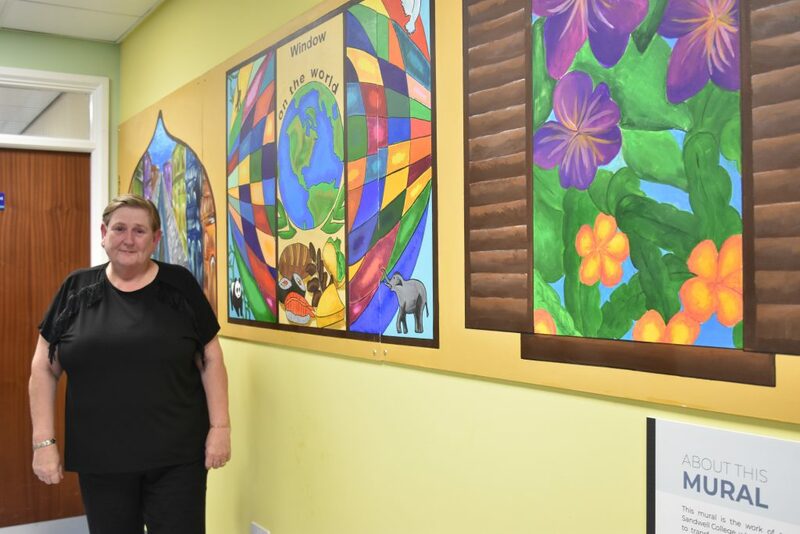 The clinic had no natural light, so they designed a mural featuring large windows depicting scenes of the borough’s multicultural communities. Patient Wendy Kimberley (pictured above), of Great Barr, said she was impressed with the artwork. “I’ve been coming here over some time now as I’ve had a knee replacement, and I have noticed the change,” she added. “It’s a real improvement to the area. Blank walls are so boring, so it’s nice to see something different. Before embarking on the makeover, students gathered ideas and feedback from patients. College lecturers praised Kissing it Better and hospital bosses for facilitating the project. “It’s been a great opportunity for students to engage with the community, hone their skills, and develop an idea, which will also help them in their future careers as artists,” added Helen Sweeting, Art Design and Photography lecturer. The makeover was conceived and organised by Kissing it Better, a locally-based healthcare charity that promotes simple ideas to improve patient experience. The charity works at both Sandwell and City hospitals, creating projects where students can use their talents to make a difference to patients, staff and visitors.